Your membership in the Conservancy and your donations will allow the volunteer time of the Directors, and others, to work more effectively to further the Mission of the Conservancy. This website is intended to better inform our members, and the public, on the issues facing the Conservancy, and the work of the Directors. Communication is ongoing with the Provincial Government, the Lyackson First Nation, and others, on these issues. Research is being conducted to better support the Mission of the Conservancy. Membership fees, and donations, will be applied to the costs associated with these, and other initiatives. At present, we accept membership fees in the form of cash, cheques, bank drafts, and etransfers. 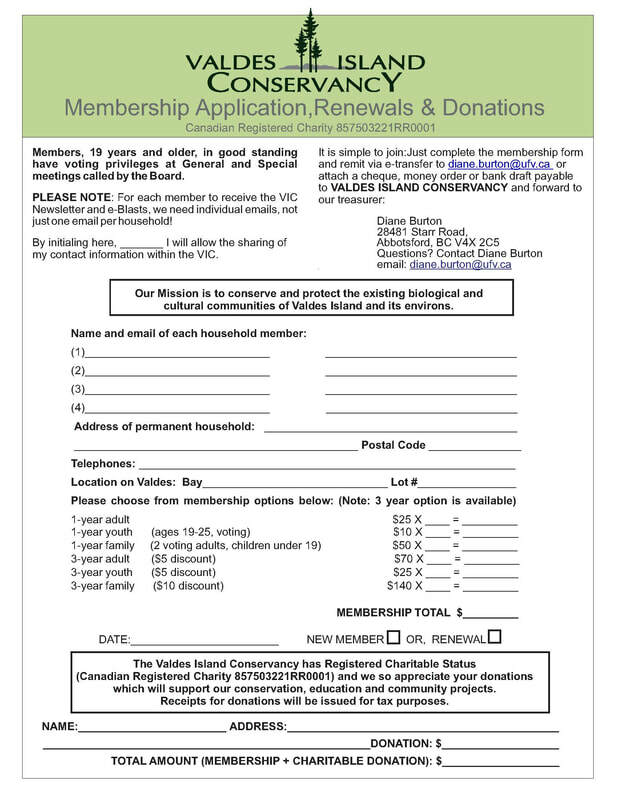 Annual memberships expire on August 31st of each year, ahead of the Valdes Island Conservancy Annual General Meeting held on Valdes Island in September, the Saturday of the Labour Day long weekend. Members in good standing have voting privileges at General and Special meetings called by the Board and are eligible to join the Board and Committees. Want to get our Newsletter? Send us your email, and we'll get you on our mailing list.